One night at the Seafarers Center in Genoa, where who is away from home for many months can finally see his child. At 5.00, arrives the "Al Qusayr," flying the Egyptian flag. Next at 5.30, the "Ever Wealthy," Panamanian ship carrying aluminium. At 6.00, on the "Janas" loaded with cars, fly the Italian flag. At 7.00, enters the harbour the Turk ship "Osman Mete" .The volunteers of Stella Maris as every evenings, they are looking at the fax from the Harbour Master with the arrivals of the next day:« we go on board only on ships; where foreign crew, work in conditions of slavery, without any certainty of a salary, under flag of convenience, that make permissible the illegitimate. Or we go on board those ships berthing at wharves less equipped, without a telephone or a bar». The sailors listen to: these are theirs histories. 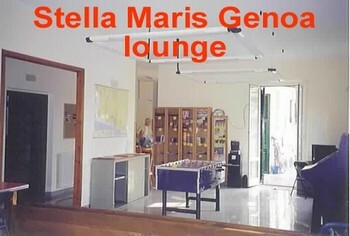 It is night and we are in the sober but pleasant Stella Maris Center. Outside the blade of light from the "Lanterna" (Genoa famous lighthouse) cut the dark with an equal rhythm, lighting the room, then light, dark, again light, and longer dark. Also the faces light up, and are different for color and features. There is Nicola the Romanian, there is Ajit the Indian, there is Rommel the Filipino, and there are also Alì and Ahmed from Iran. Later on, also two Chinese arrive, they greet everybody, and they go directly to the billiards. Do you know them? « No, but Stella Maris is present in hundred of harbours around the world, seafarers know it and as soon as they are in port they look for it- a volunteer explain - Or we are looking for them». At the Stella Maris in Genoa they know well seafarers,« people that for months doesn't see their family, living in narrow spaces, working 12 hours a day for little money. For example a Russian a family man, has been send to Genoa to join his ship: he doesn't speaks Italian, the agent paid by the owner should take care of him but he doesn't, the Russian doesn't know his rights. At sea for a month and arrives in Singapore, where the ship stay few hours. Then return to Genoa, some time to a private berth, where there are no immigration facilities, if the agent doesn't take care of the crew; they are not allowed to go ashore. On the wharf not a bar, not a shop. He is desperate, the few hours gone, the ship returns to Singapore». It is almost surreal to talk about God, in this Genoese night, with sailors from around the world, so different, so equal at the same time. 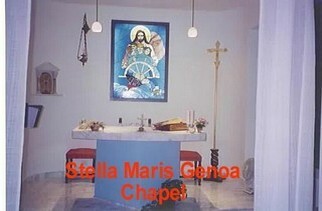 In the chapel start the prayer and each of the man follows it on his own way. The Filipino follows the prayer, on his ship all day long the rosary bounces from the holds to the bridge through the loudspeakers, with the voice of the captain. But also the Hindu, for twenty minutes with his eyes closed and his hands together. Alì and Ahmed, listening to. At last is time for Nicola, everybody waiting for. The Romanian sits down in front of the computer. After few instants an image appears (out of focus), that moves and flickers, in black and white, but it's the best he has ever seen: she is called Nadja and she is four months old. And for a little bit she is a daughter for all the seafarers present.